cafe ponte is still probably my favorite restaurant in the state. but if i still lived in south florida, it might be michael's genuine. oh man, this place was good. it is in the design district of miami, which is very near the exit that i used to take to get to work when i worked at the herald. we went on a sunday for dinner, and i was kind of glad, because if we had come when all the design stores were open, dinner might've end up quite a bit more expensive. we passed some really cool tile and furniture stores, all of which were closed. no big deal. i don't have anything to tile right now anyway. michael's came on to the radar on two counts: first, it was one of the 10 restaurants that ny times critic frank bruni named as the best new places in the country. then, i started watching a show called after hours with daniel, a show in which daniel boulud, one of the most-respected chefs in the country, goes to different restaurants and throws an after-service party. the second season was in miami, and michael's genuine was one of the episodes. the chef, michael schwartz, has a wood burning oven, and that is clearly one of his favorite toys. i'm ok with that. the menu is broken up a little different than most. instead of appetizers, salads and entrees, it's headings are snacks, small, medium, large and extra large. the idea is to mix and match any number of plates depending on how hungry you are and how willing you are to share. on the snacks, they have deviled eggs. pam isn't interested, but i am. so i got those. beyond that, we decided to get a small, medium and large, and split them all. 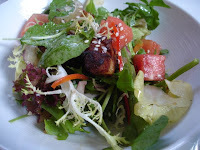 for our "small," i was debating two: the pork belly and watermelon salad or the panzanella. panzanella is a bread and tomato salad. our waitress said pork belly and watermelon salad. i said ok. i still bet the panzanella was good, but what we got was great, too. there were big hunks of fried pork belly, which is basically uncut bacon, with chunks of watermelon. they were mixed in very bitter greens, which are usually not my favorite, but when you got a little bit of everything on the fork -- some bitter greens, some soft cold watermelon and some crispy rich pork -- it was fairly spectacular. the greens were dressed with a soy lime vinaigrette, which didn't hurt anything. for our medium, pam picked the wood roasted vidalia onion. 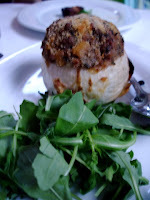 it was stuffed with ground lamp and apricots. it was pretty spectacular. the onion definitely took on some flavor from the wood oven, and was cooked perfectly, just long enough to soften the texture a little, but not so much that it lost its texture. 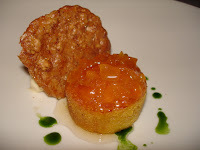 the lamb and the apricots played very well together. after the onion came out and the deviled eggs hadn't come out, i asked, and they came out almost immediately. 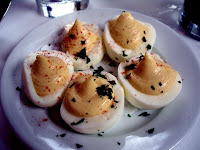 i was pretty excited when i saw them on the menu online, because i love deviled eggs. these weren't bad, but they weren't great. there was something weird about the texture of the filling. generally, it is a mixture of yolks, mayo and mustard. there was almost assuredly something else in there, and i have no idea what. i mean, i almost want to say butter, or even whipped cream maybe, both of which are probably wrong, but it was a little weird. i mean, i ate them all, but i was hoping for something familiar and new at the same time, i think, and would've been happy with familiar. but it was just new, and not necessarily in a good way. we were planning on a large, but we ended up with an extra large, because the wood roasted whole local snapper sounded really good. and it was. 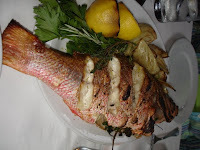 it was a spectacular presentation, with a whole fish coming out with a side of roasted fennel and grilled lemon. they offered to filet it for us after bringing it out, and we took them up on it. when it came back, it was deboned and put back together, still looking whole. the fish was so good. juicy and mild. the fennel was perfect. and i love grilled lemon. it takes something good and makes it better. we split two desserts, too. first was a meyer lemon tart with blueberry tarragon compote (like a jam) and a berry float. the tart was like a really good lemon bar, and the sweet compote offset the tart lemon really well. the berry float was a really strong berry soda with a little ice cream on top. there was something else on the corner of the plate that was really dense and tasty, but i have no idea what it was. its not on the menu. bonus. 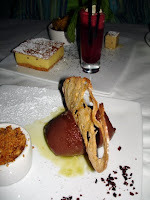 the other dessert was called a chocolate cremoso. this dessert is worth driving to miami for. wow. the chocolate was a really big curl of super-dense mousse, and it was sprinkled with sea salt. i LOVE salted chocolate. there was a toasted thin slice of sourdough on top, which may seem weird, but it worked with the salted chocolate. there were what i would guess are coffee grounds on the side of the plate, and i dipped each spoon of the cremosa in them, and that was a net plus. on the side was what was called an espresso parfait. i might've guessed it was hazelnut ice cream with a hazelnut toffee on top. seriously, i'm coming back, and this better be on the menu. we've had a great weekend, seeing old friends on saturday night, and doing, really, nothing sunday before dinner. oh, we had lunch at baja fresh, which we frequent when we go to california, so it was nice that there is one 5 blocks from our hotel. we went shopping on the way home, stopping at sawgrass mills to check out the crate & barrel outlet and brandsmart because we need a new double oven. ours died a couple of weeks ago, and fixing it was going to cost about 2/3rds what a new one would cost. blech. so, about 270 square feet later, done with one room. the wood is tiger stripe stranded bamboo. i put the sealer down thursday before work and finished after work on friday. then on saturday i got a little less than half done, but i got most of the cuts done. then on sunday i just flew down the lengths of the room. the room is about 26 feet x 10 feet, plus a closet. so it was a pretty big room. love the look of the wood, tho. 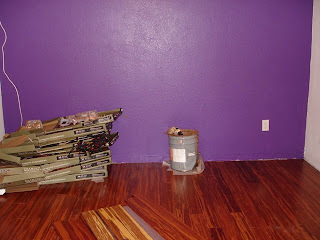 i'm planning to build a books shelf/tv stand on the purple wall, but not until after taking next weekend off. i can't believe how tired i am, and that i have to go to work in the morning. tho i have not yet checked my lotto tickets. my left hand took a beating on this project. 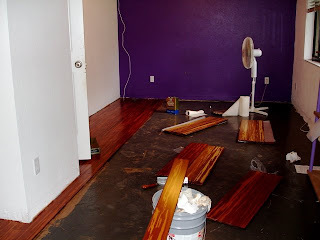 when i was kneeling to spread the glue and place the boards, i was always leaning on it. its weird how weak it is. i almost dropped a salad when i tried to move it with my left hand. and my pinky isn't really taking orders. i iced it down for a couple of hours, and its better. i'm sure it will be fine. i can't believe how old i am. so, first of all, i didn't smell anything. i mean, growing up in pittsburgh, i always heard that cleveland stinks. everyone said so. i don't know. i smelled nothing. that said, we drove over from toledo for the expressed purpose of going to lola, michael symon's restaurant here. he is the new iron chef on food network, and my favorite now that mario isn't really playing anymore. but, cool thing (well, i think so): i have now eaten in the restaurants of all four iron chefs that have restaurants. three of them in the past 10 months, actually. so, yay me. first, i hardly needed to look at the menu. basically, i needed to make sure they still had what i had been planning to get from my previous perusal of the restaurant's website. 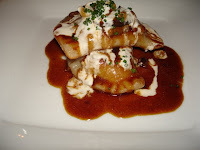 appetizer: beef cheek pierogi was there (thought i'd be tired of pierogi by now? ha. you so don't know me.) they were two big pierogis filled with braised beef cheek. very tender meat. i might've thought there would be potato in there, too, because what goes better with braised beef than mashed potatoes. there wasn't and that was fine. but, just saying, it would've been good WITH, too. y'know. in case anyone is listening. it was sitting on a demi glace sauce that made me very, very happy there was still a piece of bread on the plate, because i sopped that up. on top, there were wild mushrooms and a horseradish cream sauce. all good. 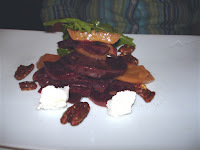 pam started with the beet and goat cheese salad, always solid. big chunks of red and golden beets, with arugula and candied pecans. and goat cheese. i tried. i approve. 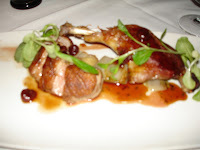 i had not prepicked an entree before walking in the door, but i might as well have as soon as i saw duck on the menu. the breast was roasted and the leg was confit. the two pieces were on top of braised endive, which i have never had braised, and i would've assumed i would not like, because as a general rule, i don't like cooked greens, with a couple of exceptions. well, add braised endive to the list. it was pretty good. there were also pickled cherries on the plate. let's just say, there were not enough pickled cherries on the plate. because 50 would've been fine. i kinda wished the breast was grilled instead of roasted, but it was good. and the skin was crispy. that's the game, right there. 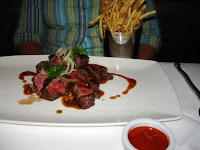 pam had the hanger steak, which looked awesome and had what they called a pickle sauce, which, i don't know what that means exactly, but it was really good. now comes the portion of this entry where you learn just how much restraint i have. there were THREE desserts that i wanted. pam was full, and didn't want any. i wanted THREE. so, how much restraint do i have? i only ordered TWO. the waitress told me it wasn't a big deal, because they were small, and i'm thinking, well, don't say that too loud, they're $9 each, but it works for me. the other dessert was called "savannah summer." and barry harrell, if you read this, you should cover your ears. it was cornbread (and being a dessert, probably had some sugar in it. 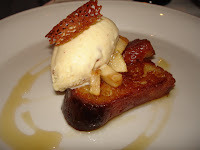 i TOLD you to cover your ears, barry), topped with peach jam and served with BUTTER ice cream. wow. that was awesome. there was a cookie of some sort in there, but it had sweet cornbread and butter ice cream. that was all it needed. i had told the waitress that i really couldn't leave without trying the 6 a.m., and she said she understood, but she was pointing people toward the savannah summer. she's right. good thing i got both. and good thing i had to walk a mile back to the car. the one i passed on was a dark chocolate with cherries and hazelnut praline thing. honestly, i don't understand how i didn't get all three. chef symon was in the house. i knew this because i heard him laughing. i LOVE his laugh. it makes me smile everytime. and i saw him, but did not get to meet him. shame. we started the day in cleveland by going to the westside market, which was really cool. there was one wing with fresh produce vendors, and many had golden watermelon. i have seen yellow watermelon before, but this was gold. it was beautiful. then inside the building were a bunch of meat and dairy vendors. lots of cool stuff. i wish i was cooking here. we had lunch there. i had a gyro from steve's, which, apparently, according to no less authority than maxim magazine, has the best gyros in the country. i know this because it was posted on their stall, not because i read maxim. it was good. i've probably had better, tho. we also had some apple strudel and a sample of dichotomy popcorn, which is a mix of caramel and cheese popcorn, and is way better than it sounds. we also went to the rock & roll hall of fame, which was ok. it seemed like more of a museum than a hall of fame to me. and there is a difference. there just wasn't that much stuff about the inductees in there. shrug. i liked looking at the display of stuff from queen, and i was reminded that i am very disappointed that i never got to see them in concert. i also thought it was weird that, in a video presentation about how videos changed r&r, they listed four artists that changed the way videos were made. they listed michael jackson (sure), madonna (of course), a third, i think it was prince, which i could also agree with, and the fourth ... tom petty? i mean, i like tom petty enough, but a traiblazing video artist? because of the weird alice in wonderland/mad hatter thing? please. so, technically, it is the lagrange street polish festival. it was sold to me, however, as pierogifest. then, i started hearing it being referred to as polkafest. whichever, that was why we were in toledo. a lot of chefs are going all avant garde with pierogi these days. not here. here, there were three kinds: potato, cheese, or potato/cheese. frankly, that is as it should be. pam and i split a combo plate (pictured) from one of the booths. 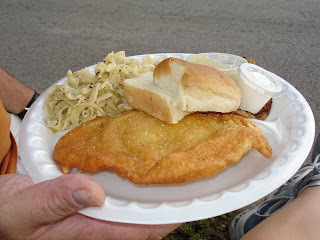 it had a giant deep fried pierogi, polish dumplings and a potato pancake. gotta say, i wasn't a huge fan of the deep fried pierogi. i know that is an accepted way to cook them, but it just seemed too much to me. my favorite way is pan fried, but simply boiled is fine with me, too. the pancake was ok, and i liked the dumplings. but i usually do. we met up with pam's internet friends, who were selling beer at one of the booths. i tried one of the polish beers. it started with an O, let me go check the magic internet ... okocim, maybe? something like that. anyway, it was good. then we sat under a tree and listened to the polka music for awhile. and when pam's friends finished, we walked the street again, and i got a pigs in a blanket. admittedly, i'm not sure what the singular on that should be, but i know that pigs in a blanket has nothing to do with hot dogs and tubes of biscuit dough. it is a stuffed cabbage, and done well, they are spectacular. then we watched more polka -- the uncle of pam's friend dawn was in one of the bands -- and on the way out, at about 10, i got a couple of potato pierogi. pan fried. they were very good. on sunday, i dropped pam off to hang with her friends and i went for a drive. i went to a farmers market that had one vendor, then to a park on lake erie, checked out the lighthouse festival there, and had lunch at tony packos. tony packos is famous for two things. first, it was featured on an episode of m*a*s*h. apparently, klinger was really, really excited to get a shipment of food from tony packos, and before they could eat it, there was some tragedy in the OR where they needed something, and the only thing that would work was sausage casing. so he had to give it up. anyway, my seat was right under the box that served as the prop on the show. the other thing they are famous for is that when celebs come in, they have them sign fake hot dog buns, then put them on display. i took a lap around the place to see who was there. apparently, melissa etheridge has been there more than once. and i thought it was funny that most bands all signed one bun, but three of the guys from reo speedwagon each got their own bun. kevin cronin, neil daughty and alan gratzer. cool. later, i went over to dawn's house, where we had pizza and food picked up from the polish fest, including boiled pierogi. covered in a butter-like substance. mmmmmm. then we watched design star and next food network star, and it was a blast watching with tam and nina. i would've bet a million dollars i was the only one watching that show. i'm a writer, editor and amateur caterer. there was also the matter of a grilling contest. most of the posts here over the next year or so will be about my attempts to cook everything in mario batali's babbo cookbook, by any means necessary. i'm not including recipes, but will link to those that i know exist on some officially sanctioned website. otherwise, they're in the book. Mario's foundation benefits childhood reading and hunger initiatives. To learn more, click the logo.